Posh skipper celebrates the only goal of the game at Swindon. Photo: Joe Dent/theposh.com. 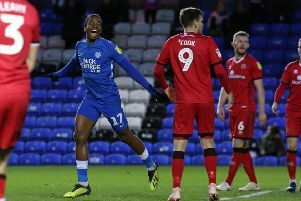 Captain Chris Forrester grabbed the only goal of the game as Peterborough United bounced back to form at Swindon today (January 21). Forrester struck 52 seconds into the second half after fine passes from Marcus Maddison and Lee Angol. It was a superb bounce back after the 5-1 mauling at Bury last weekend. Posh midfielder Gwion Edwards is fouled by Swindon's Ben Gladwin. Photo: Joe Dent/theposh.com. Posh defended superbly as goalkeeper Luke McGee didn’t have to make a save all match. Posh handed on-loan central defender Dominic Ball a debut and pushed Michael Bostwick forward into midfield. Angol and Maddison were both recalled to the starting line-up. It was a battle of the midfield diamonds and the teams pretty much cancelled each other out in a goal-less first half. But Posh almost scored after four minutes and should have scored four minutes before the break. Posh star Marcus Maddison in action at Swindon. Photo: Joe Dent/theposh.com. Ryan Tafazolli’s header from a Maddison free kick forced home ‘keeper Lawrence Vigouroux into a decent low stop early on, but Tom Nichols had no such excuse for volleying over the bar from eight yards after Andrew Hughes’ excellent cross teed him up. Swindon passed the ball well, but they were a little slow to get their shots away, enabling Bostwick and Ball to make strong blocks when chances opened up for Nathan Thompson and Ben Gladwin. The return of Gladwin to the County Ground on loan and the arrival of three Chelsea players on a temporary basis made this fixture look a lot tougher than it did a few weeks ago. Posh’s 5-1 defeat at Bury last weekend had the same effect. So Posh, 4-1 down at the break last week, would have been happy enough to reach the interval with a clean sheet. They were even happier 52 seconds after the re-start when skipper Forrester shot them in front. Gwion Edwards started the move by winning a tackle. Maddison carried the ball forward before playing a lovely reverse pass to Angol on the edge of the home area. Angol’s control and composure were good. He fed Forrester who took his time before firing hard and low past Vigaouroux, who got a hand on the shot, but couldn’t keep it out. And to be fair, Posh were comfortable for the rest of the match. Ball’s debut was impressive, while Bostwick was outstanding in front of the back four.